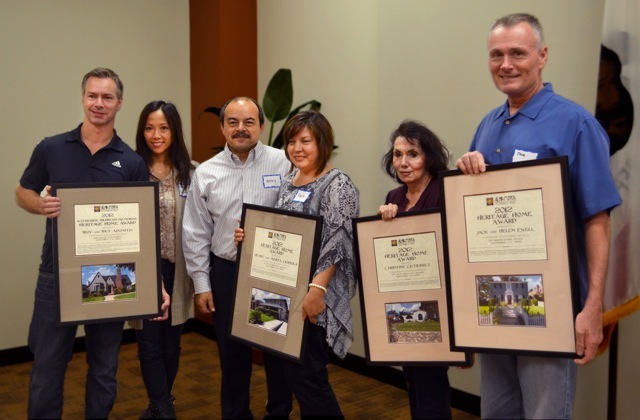 The recipients of APG’s 2012 Heritage Home Awards pose with their certificates. Alhambra Preservation Group (APG) presented its 2012 Heritage Home Awards on Thursday, October 11 at a ceremony in Reese Hall of the Alhambra Civic Center Library. The event was attended by more than 50 Alhambra residents. This year’s four homes are located throughout Alhambra in the Mayfair Tract, the original Alhambra Tract, the Midwick Tract and a little-known area of land in Alhambra originally named the Wiesendanger Tract after a Los Angeles real estate magnate. The honored homes included the following architectural styles, which are prevalent in Alhambra – Prairie-styled Arts and Crafts, Spanish Colonial Revival, English Tudor Revival and Colonial Revival. Look for a four-part series featuring the honored homes to appear here monthly beginning in December 2012.